Okay, so I never used to be a HUGE fan of wearing false lashes, but now I feel I can’t really go ‘out out’ without them on! I have found a really easy way of applying them, and therefore, I am more inclined to reach for them when finishing my makeup look for a night out. I have naturally very long, but fair eyelashes, so I guess for me, I like to wear eyelashes for the colour and the thickness rather than the length (although a extra long eyelashes are super cute). I was kindly set a few sets from falseeyelashes.co.uk, and jumped straight into trying them out. This site has soooom many lashes to choose from with such a variety and at all different prices, so I would highly recommend checking them out. I can’t wait to order some more, as there are a couple I have got my eye on. 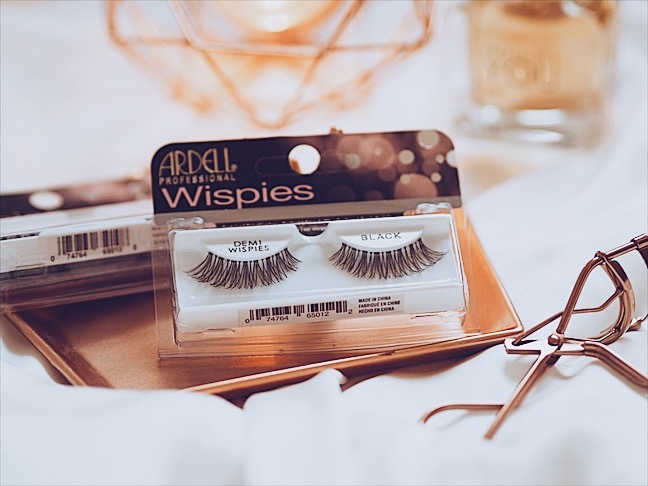 I was sent the Ardell invisiband lashes and they retail for £4.49 (bargainnnnn. I literally love these lashes so much and because they have the invisiband, it’s really hard to tell you are even wearing them. I was also lucky enough to try out the House of Lashes Iconic lashes, and oh wow, I am in love! They are such a gorgeous shape and I live the way they look when they are applied as the finishing touch. These ones are a bit more expensive (£14) but they definitely complete the look and with the duo eyelash glue, they last all night and can be reused again and again! Overall, this website is your one stop shop for amazing lashes, and at really good prices! What is your fav kind of Lash glue?! I love wearing lashes but they never seem to stay on long ago! These are so good! I love my Wispies but like you I only wear them ‘out out’ they’re just too much for everyday use. I haven’t tried the other brand you mention. They’re so lovely aren’t they! The others are realty good too ?? ?